There are four teams, each of which has to place all of the tennis balls from central location in its team’s square Once all the balls are in a team’s square, that team wins. Space: A large, relatively flat open space at least 30 feet square. This activity is suitable for both indoors or outdoors. 2. Arrange the five Toobeez triangles on the ground, and arrange them in the shape similar to five dots on a side of dice. 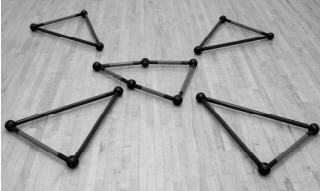 Spread them on the floor so the outer triangles are each at least ten feet from the center one. 3. Place all balls in the middle (neutral) triangle. 4. Divide into four even teams. 5. Have each team pick a triangle and gather by it. This activity can be enriched by creating team identities which match your population. For example, if you’re facilitating a corporate group, you might have a “design team” and an “engineering team,” a “management team” and a “union team.” Likewise, if you’re facilitating a diverse group you may break out a team based on gender or age. Be creative. NOTE: AVOID having four captains pick their people (were you ever picked last?). In this activity, your goal is to place all the tennis balls in your team’s square. Once you have all the balls, you win. You must follow these rules:1. There is no throwing or tossing of the balls. 2. All the balls must be out of the middle before you can take them from other squares. 3. No defending the squares. Any questions on the material covered? (Answer any questions and get teams situated by their Toobeez Square). Begin. Once the activity begins, your role as facilitator is two-fold: 1) to time the rounds and provide suggestions after each round, and 2) to observe. After three to five minutes, stop the activity. Most likely, participants will be out of breath and no nearer to winning. Ask them to regroup with their teams and strategize for two minutes. After two minutes, signal time, and have the participants return to their starting positions. Place all the balls back in the middle square, and start again. NOTE: After Round 1, one group may come up with the solution; however, most groups will try to position the people “strategically” and plan for faster ball transfers, etc. After another three to five minutes, stop the activity. Most likely, participants will be no nearer to winning and are becoming frustrated. Ask them to circle up as a group and perhaps “learn from each other.” This will usually produce better results. If they need prodding, restate the object of the game and the rules. Someone may suggest that the groups work together, another might ask if the squares can be moved (YES). In either event, you know that the teams are on the right track. After a few minutes, call time and start again. With some planning and facilitator prodding, they should realize that the only way to win (other than all of the other groups agreeing to lose) is for them all to win (i.e., place all of the balls in the middle square, and then place their squares around the balls). During the activity, listen and look for the following: How people work together, cooperate, and generate ideas. The questions below, based on the primary Learning Intentions, are provided to guide your observations. Does anyone mention working with the other teams? Do they? How do people handle frustration? How are they generating and receiving new ideas? Most teams will “win” by the third round. You can choose to play until they meet the objective, or you can call time after a period of time and conclude the exercise. The debrief should be an interactive discussion. Lead it by offering a series of questions and soliciting responses from the participants. To begin, ask questions about the activity itself and continue with specifics related to the skills you want to address or highlight. You may stick to one area of focus or choose to cover many topics. Suggested questions are offered below to guide you in facilitating this debrief. The debrief is organized with an Opening and Closing and then by Learning Intention, and it may be used in a variety of ways. You may use just the Opening and Closing for a basic debrief or add the Learning Intention-specific debriefs in between. To include the Learning Intention specifics in your debrief, either pick one or two questions from each area in order to touch on many topics or work in depth on one or more areas of learning and go through all of the questions for that topic(s). Look through the questions, TIPs, FCs, and Transitions prior to the raining session in order to choose which ones you will cover (see “How to Use this Book”). The intention of this activity is to develop teamwork and cooperation. However, it offers many lessons, so let the participants share with you what they learned as well as their comments as to the purpose of the activity. Where in your professional life do you work on or with teams? How do you deal with them? This activity is a platform for action. Teamwork is when your individual accomplishment contributes to the team objectives. To succeed, one must place the focus on the greater group’s goal. What did you learn about teamwork, cooperation, and advancing creativity? Where in your professional life do you work with teams, and what can you now do differently to increase success? Were you more concerned with your contribution or with working as a team? Where did you focus your energy? What is preventing or blocking you from expanding your idea of team? How could you overcome it? When people work together in an empowering way – one in which everyone is listened to and respected as a contributing member of the team – results are impacted. We often interpret situations as “us versus them,” or “mine first”, when all parties would benefit by working together. As we expand our interpretation of “team”, we also expand the possibilities for success and achievement. So, putting teamwork and cooperation above your personal concerns and into action, what do you think the results would be in your organization? While we may share many similarities, each of us thinks in a unique way. Encouraging people to listen and to share their own ideas keeps organizations fresh and innovative. Use the following questions to generate a discussion about creativity, its value, and how to tap into the creative ideas in everyone. How were ideas generated and received? With cooperation, everyone can win rather than someone having to lose. Being willing to share your ideas and be open to the ideas of others creates greater possibilities for solutions. When working in a team, look to redefine who is on your team.